A ROOFER has been hit with a £300 fine for keeping empty crisp bags in his van – because he doesn’t have a licence to carry waste. 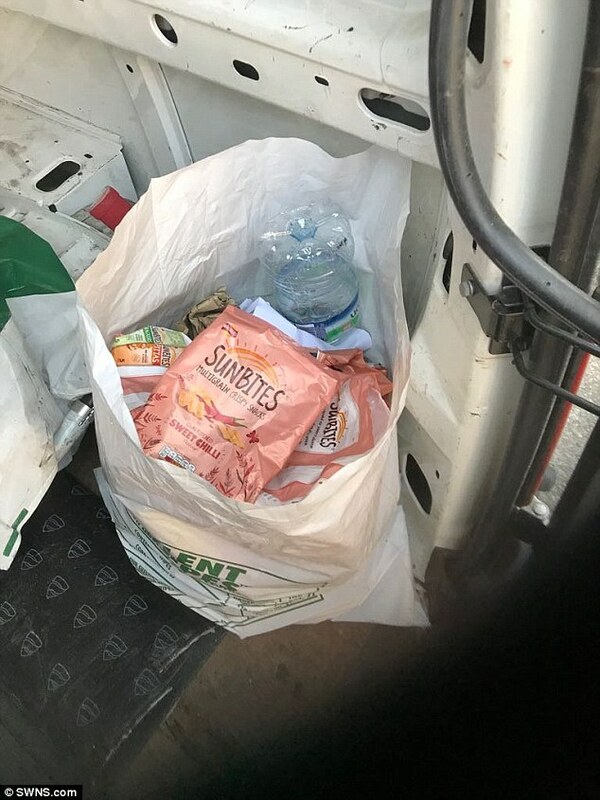 Stewart Gosling, 43, kept empty crisp packets, sandwich wrappers and water bottles in a plastic bag in the back of his van. But when he was pulled over by council workers carrying out spot checks they told him he was breaking the law for carrying the rubbish without permission. He tried to appeal the fine but has been told he will be hauled to court if he doesn't pay the penalty. It costs £229 (+VAT) to register for a waste carriers licence which lasts for three years. It's then £154 for a renewal. Stewart said: "It's so infuriating. The working-class man gets penalised for going to work basically. "I've not fly-tipped. I've not left it in someone's garden. It's frustrated the hell out of me. There was just a bag of rubbish, bottles, crisp packets, newspapers and sandwich wrappers." He added: "What gets me is the lack of common sense. It's a lot of money for one bag of rubbish." 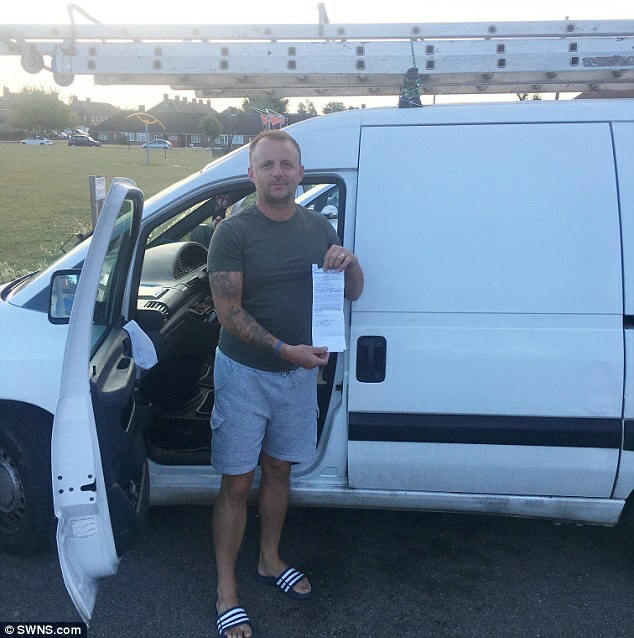 The roofing contractor was driving through Chingford in North East London when he was pulled over by Waltham Forest Council workers. They searched his vehicle before asking him if he had a waste carriers' licence - required by any business that transports commercial refuse. Stewart, a married father-of-four, said: "I got out of the van and he had a look. "They were talking about a plastic bag around two feet high, which was filled with rubbish from my lunch. "He just said, 'You're going to be fined'." 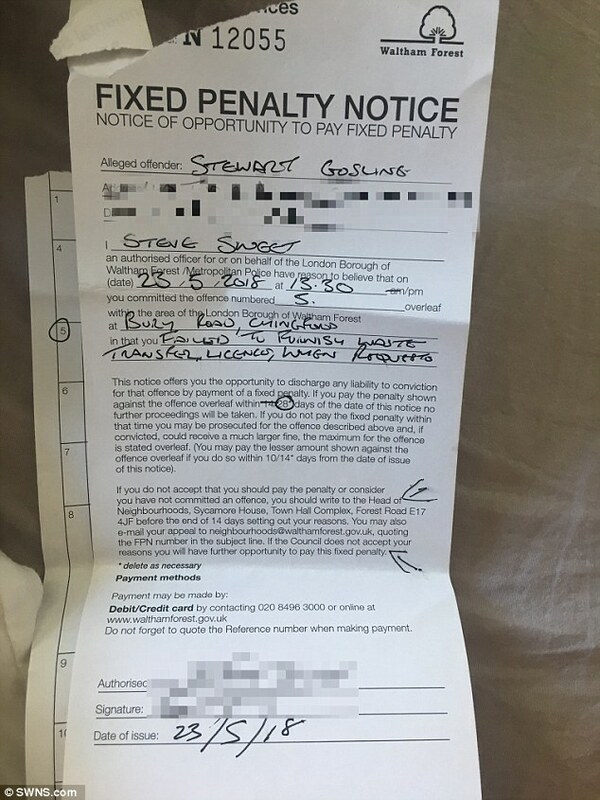 Stewart from Cheshunt, in Hertfordshire, was handed a fixed penalty notice for "failure to furnish documentation (waste carriers licence)". He was ordered to pay £300 within 14 days of May 23, when the incident occurred. Stewart said he appealed the fine, but there was a "delay" in the council's response. When he found out his appeal had been turned down he said he asked for clarification on the cost of the fine but was on holiday when council bosses replied. Stewart could be prosecuted for failing to pay the penalty on time but said he had no plans to settle the fine. He added: "It seems a bit steep to be honest. A warning would have been more understandable. "It just aggravated me. It should be common sense. I had no idea you needed a waste licence, you have to be polite to these people but it annoyed me." A Waltham Forest Council spokesman said: "The waste in this case was being transported in commercial refuse bag in the trader's vehicle. "Regardless of what the items are, if waste is being stored in a commercial refuse bag in a trader's van it is necessary that they have a valid waste carriers' licence. "It is widely recognised as best practice for tradesmen to be licensed to avoid legal repercussions, in the event they are required to transport even small quantities of waste."